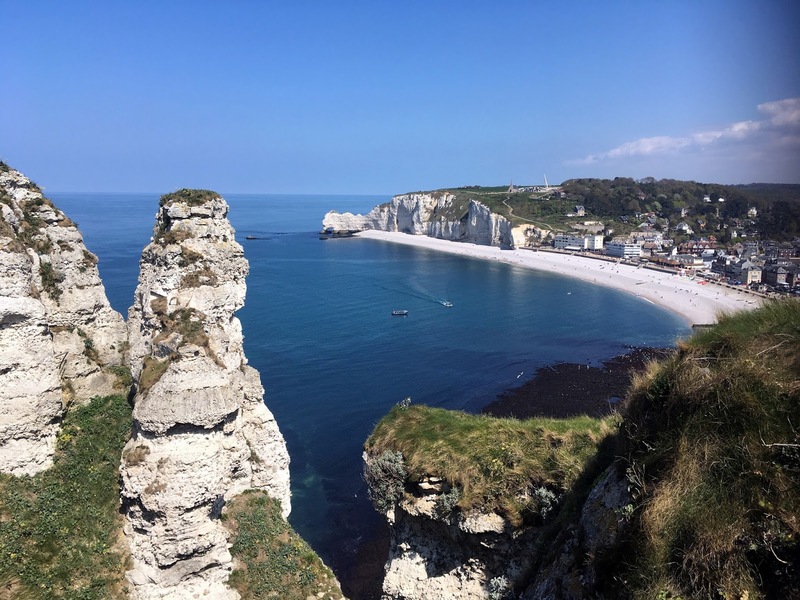 It is not that Claude Monet lied, it's just that.... notwithstanding the glory of his masterpieces, even an artistic savant of his kind fell short of capturing the beauty of Étretat. I know, I should watch my mouth but honestly, seeing is believing. 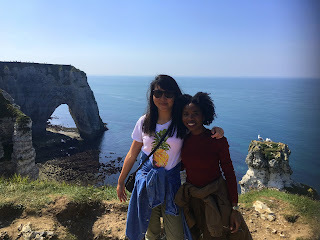 When my friend Chiu-Lin asked me to join her for a day trip to the little farm town in Normandy, I mindlessly said yes. I knew nothing about the place a part from images I Pinterest searched and then later, upon visiting the Museé d'Orsay, realised Monet had a mini love affair with it's shore lines. This was enough to convince me that I had to go and with the weather finally warming up, it was the opportune time! We booked an early morning train one Sunday, which perhaps to my own fault, we missed. With a little persistence and faith we eventually made it, albeit only 3 hours to explore. Yes, I am aware I look like a fisherman. I may or may not have done this on purpose. 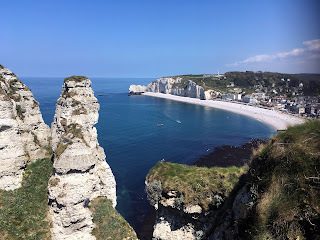 Étretat is roughly 2 1/2 hours north of Paris in the Normandy region. Getting there is relatively easy but will require a bit of coordination. We booked our train via SNFC, direction Paris to Le Havre. The train departs from Paris Saint Lazare station and just so you wont get lost, the platforms are upstairs, above the metro and RER area. Typically trains headed towards Le Havre can be found on platforms 21-26 but you will have to check the massive black announcement board 20-15 mins before your departure time to know specifically on which platform your train can be found. If you’re unsure about something, be sure to ask the staff questions so you can avoid missing your train. When you get to Le Havre, you will then need to take the line 24 bus in the direction Étretat. Bus stops are located behind the Le Havre train station and are numbered so you will have no trouble finding the right one. The bus costs 2 euros (one way) and you don't have to worry about purchasing a ticket inside the station as you can pay the driver directly. 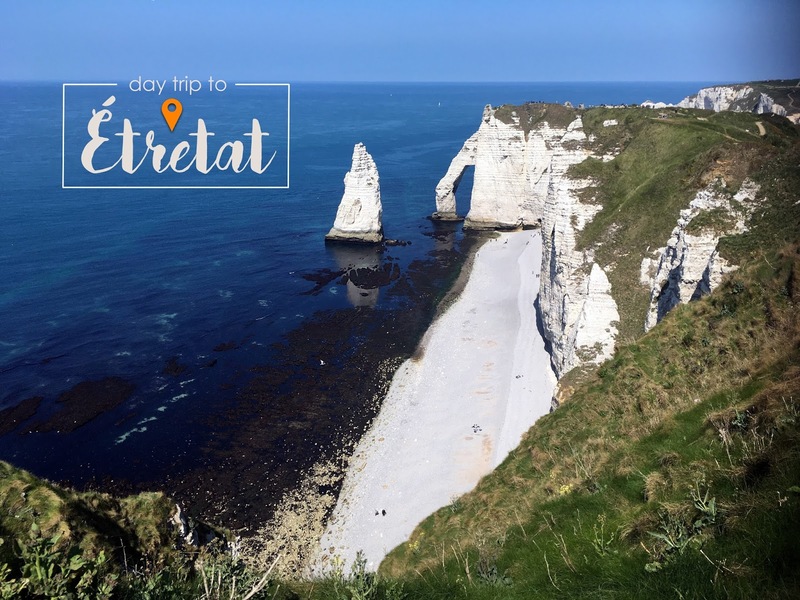 In Étretat, you will get off at the Tourism office. It pains me to write this LOL but forget about Google Maps this once. 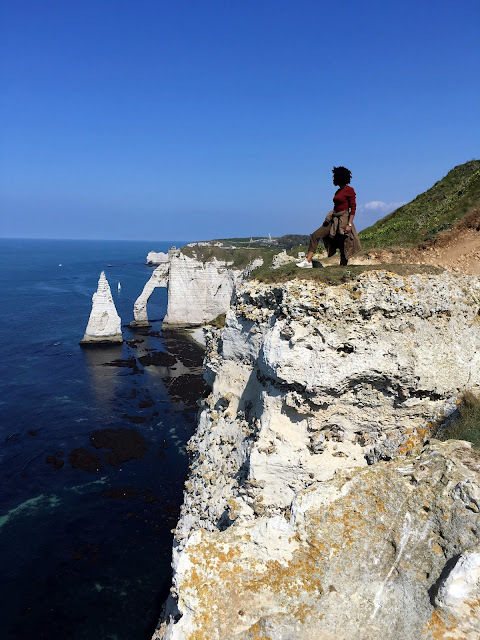 According to Google Maps the cliffs are a “20 mins walk away” from this point however, our better judgement to follow the crowd headed towards the town square and restaurant alleys resulted in a short 5 minutes stroll to the beach and cliff sides. It would do you well to check the bus schedule of the line 24 bus especially if you plan on going on a Sunday or on a public holiday. This will also help you to time how long you will be able to stay in the town and plan activities accordingly within the time frame. 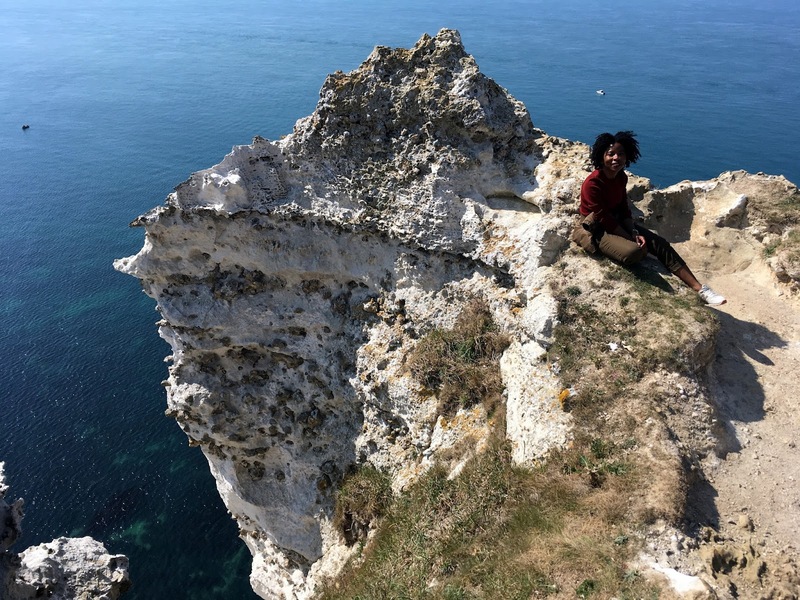 I suggest that you wear very comfortable shoes and clothes as to really enjoy the cliffs you will have to hike for about an hour (or more). Also, the beach is made up of small stones as opposed to sand so it might be easier to navigate in sneakers. Don’t forget your sunblock if you go late spring or during the summer season. Oh and if you’re anything like me pack snacks and water for the journey. Of utmost priority and absolute essential to making this trip even more memorable, pack your camera! 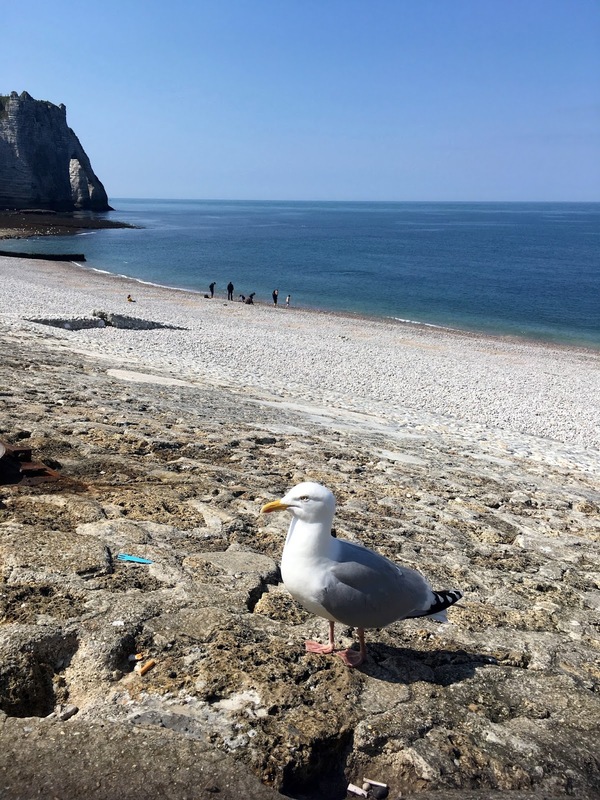 Etretat is so ridiculously beautiful, you will want to have evidence of your visit 1. for personal reverie and 2. to brandish on every social media platform (or in real life). Chiu and I had planned to have a lovely seaside picnic but after a missed train and consequently hungry tummies, we scoffed half our food down while waiting at the line 24 bus stop in Le Havre, tres romantique. Upon arriving we realised we weren’t the only ones who had this same idea though, as there were other visitors scattered on the beach front picnicking as well. 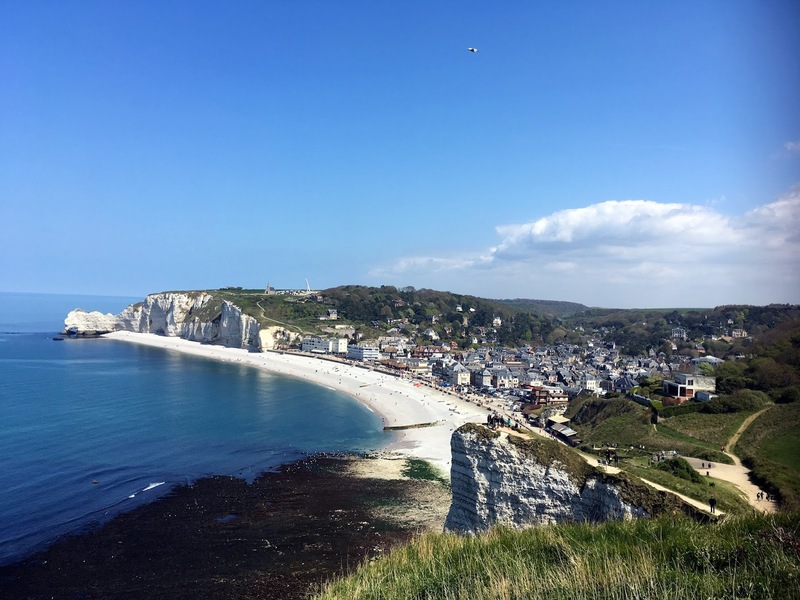 If you’re not fond of traveling with food, Étretat has quite a few choices for dining. 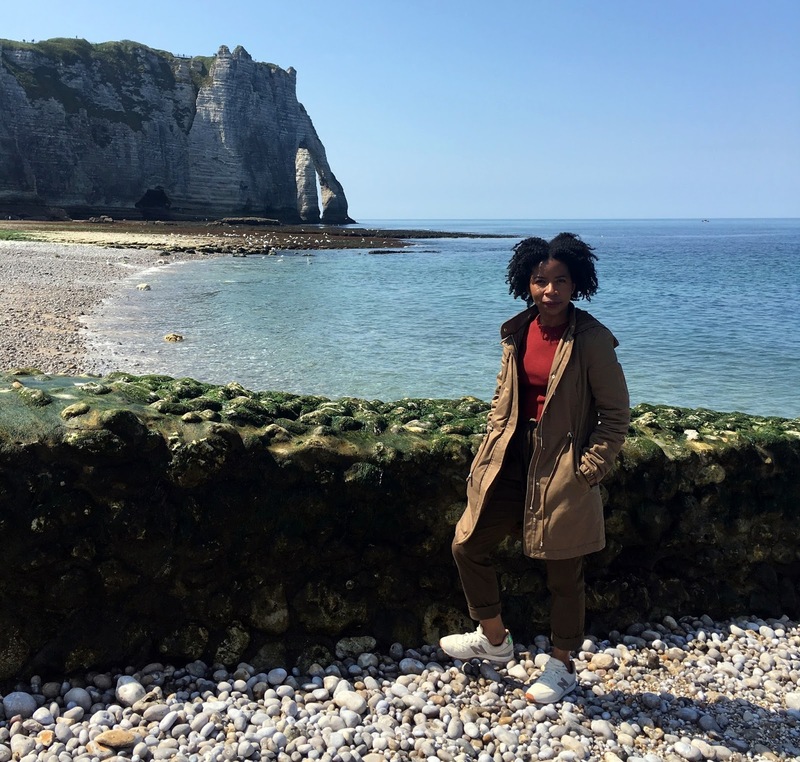 We encountered more than one Creperies, Mediterranean and Seafood restaurants with awesome seaside views. There are also several places to purchase ice cream and kids will be delighted to find cotton candy and other snacks readily available too. When you’ve had your fill, a stroll on the beach is highly recommended where you can explore caves or befriend birds. 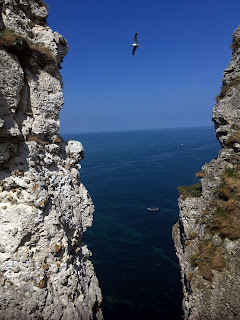 Otherwise, you can get right into the action and make your way to the top of the cliffs. The hike takes about an hour to an hour and a half depending on how long you break to be AWED by the incredible view. You might be tempted to stop halfway up but I promise you, going all the way up is more than worth it. If it is any incentive, the photo aesthetics improve with every level you go up. For kids, there are little activities on the dock like riding a carousel to keep them entertained for a while. If you’re up for more hiking, on the other side of the beach is a church perched on the top of a hill known as the Notre Dame de la Garde, even though I hadnt the time to make the trek, I'm sure it's also something worth seeing. 3 hours was simply not enough time to really enjoy the town so I didn't get to snap photos of the caves or church or other small town gems. Nevertheless, the little I did see warrants high recommendation. If you are in Paris and have a free day, you MUST visit Étretat. Whether it is with family (it’s dog friendly! 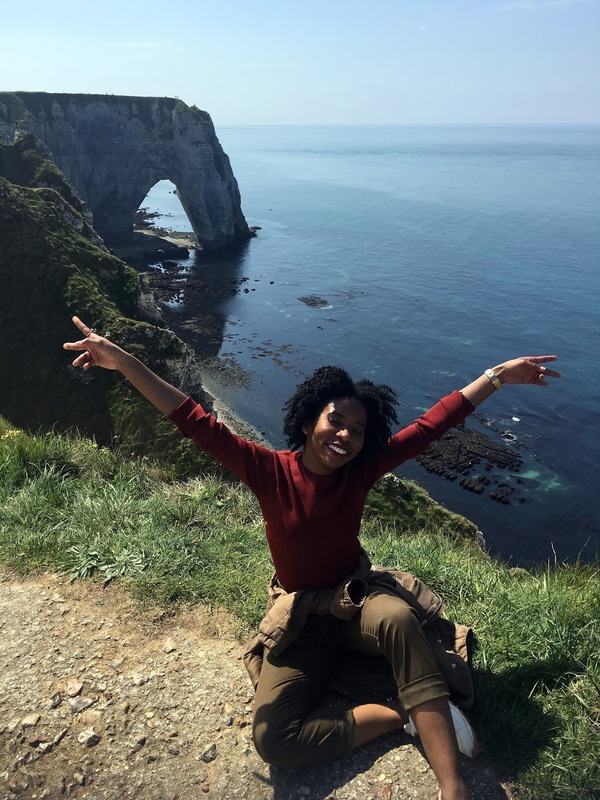 ), for a romantic day with your special someone or just an outing with friends who share an appetite for adventure, I promise you, it’s a Must-See!